Welcome to the Ecoyards Seattle Gardening Blog. You'll find articles on how to care for your newly-planted lawn, why we choose a natural lawn care approach, how to renovate a lawn, and much more. You'll also find up-to-date information on gardening events and programs in the Seattle area, practical advice for monthly landscape maintenance in your yard, and advice on what vegetables to grow and when. The Wall of Shame is growing! This image shows outdated irrigation timers that Ecoyards replaced with new weather smart controllers to save water. 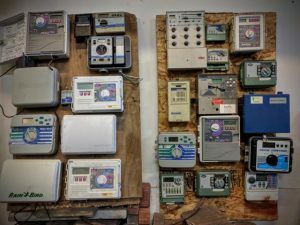 Do you have an old irrigation controller in your garage that looks like one of these? If so, we can replace the controller with a new WIFI-based controller that taps into local weather stations online to adjust sprinkler run times automatically. Equally important is that these controllers also allow you to spray your kids with the sprinklers from your smart phone. Rebates are available through the Saving Water Partnership in Seattle and King County. Contact us today if you’d like us to help update your irrigation system. Outdated sprinkler timers that Ecoyards replaced with weather smart controllers for big water savings. We’ve written a lot on this blog about ways to conserve water in your landscape. One of the easiest ways is to water your lawn and plants deeply but infrequently using a water-efficient technique called cycle and soak. In the cycle and soak method, you water in increments (or cycles) until the soil has absorbed the maximum moisture before water starts running off onto the sidewalk or streets. Instead of watering for 20 minutes straight, for example, you water for 10 minutes, wait about an hour for the water to absorb, and water for another 10 minutes. Watering two times for 10 minutes will allow your lawn or landscape to absorb more moisture than watering for a straight 20 minutes. Watering in increments allows the soil to absorb more moisture more slowly and to avoid sprinkler runoff. Water travels deeper into the ground; and roots follow, reaching deeper and broader into the ground for that moisture, creating a healthier lawn. 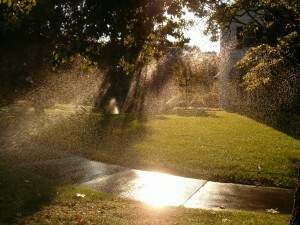 Most sprinkler systems can be programmed to water your landscape using the cycle and soak method. The amount of time you run your sprinkler will depend on the type of soil and the slope of your yard. Each zone of your landscape may need different amounts of water. Clay soils may take longer to absorb water, while sandy soils may take less time. Ideally, you want to water your lawn or landscape so that the soil is moist about 6-8 inches deep; you’ll know when you can easily push a probe through the soil to those depths. We’re happy to announce that Ecoyards owner Andy Nicholls has partnered with the U.S. Environmental Protection Agency’s WaterSense program to promote water-efficient landscapes and help consumers save water outdoors. Andy is a certified landscape irrigation auditor through the Irrigation Association. Andy has undergone testing and achieved certification for landscape irrigation auditing with an emphasis on water efficiency, through a program labeled by WaterSense. Andy is currently one of 39 irrigation professionals in Washington state who are irrigation partners of this program. WaterSense irrigation partners certified through a WaterSense auditor program are able to identify water systems that distribute water inefficiently and determine how to improve an irrigation system’s performance. By partnering with the program, Andy has committed to promoting efficient landscape watering practices and staying up-to-date on the latest practices and technologies to save water. The EPA estimates that more than 50 percent of commercial and residential irrigation water use can go to waste due to evaporation, runoff, or over-watering. WaterSense partners like Andy can help customers save water and money while reducing stress on water systems and maintaining a beautiful landscape. 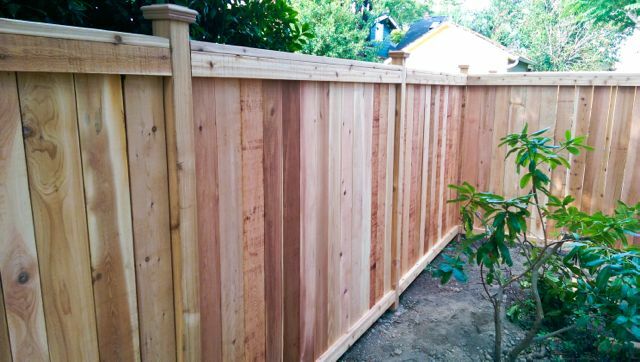 We’ve blogged in the past about the many ways we help our customers save money and water, including installing a smart, water-efficient irrigation system, fixing water leaks inside and outside the house, upgrading inefficient sprinkler systems, and conserving water through smart landscape design. Andy Nicholls, owner of Ecoyards, has become a certified landscape irrigation auditor through the Irrigation Association, the leading membership organization for irrigation professionals. What does that mean for you as an Ecoyards customer? Irrigation Association-certified professionals like Andy are leading the way in the evolving field of irrigation technology and smart water management. Simply put, they are the best in the field. In hiring a certified professional, you can feel confident that Andy has state-of-the-art training and technical skills to audit varieties of irrigation systems. He’s trained to perform field tests on irrigation systems to determine whether they’re efficient, as well as examine plant water use, soils and local weather data to calculate accurate water schedules. As a certified landscape irrigation auditor, he’ll work with you to manage overall irrigation use on your property. To be certified, Andy passed a written exam, demonstrated irrigation-related work experience, passed an audit of his work, agreed to follow a code of ethics and has committed to continuing education requirements. You wouldn’t hire an electrician or a plumber who wasn’t licensed or endorsed, so why would you hire someone to install or maintain your irrigation system who is not certified? A certified irrigation professional not only provides keen technical know-how, but they also offer a higher level of specialization and service. 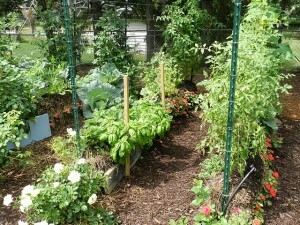 Straw bale garden. Photo by GradyJames via Creative Commons license. 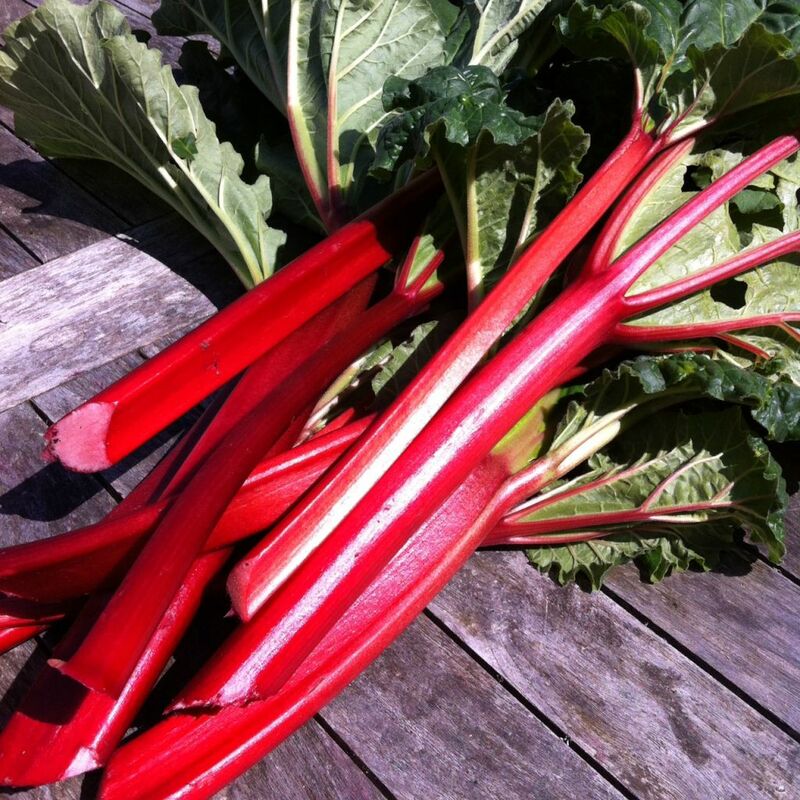 Several years ago when I took an organic gardening class through Seattle Tilth, our wonderful instructors introduced us to one of the more intriguing ways to garden. 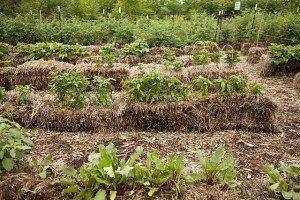 It involved using a bale straw as the “raised bed” for your vegetable plot. If you lacked good soil or any soil for that matter (perhaps you only have a concrete patio out back? ), you could use straw bales as would-be container. 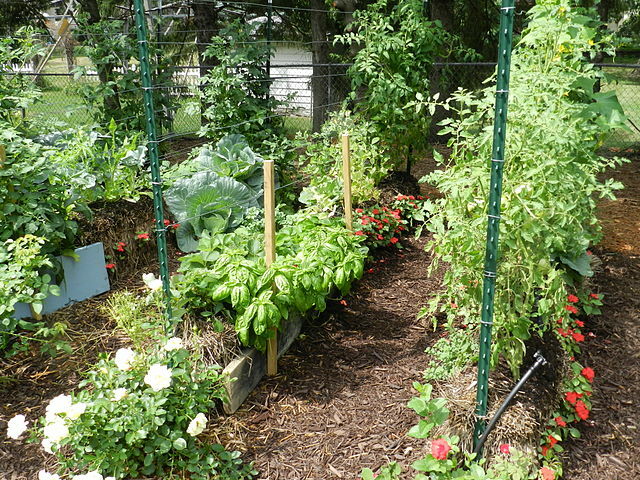 Scratch the top of the bales, add a few inches of compost or potting soil, plant your seeds, water (set up a drip irrigation hose), weed, and watch the lettuce and other veggies grow. At the end of one or possibly two growing seasons, take the bales apart and add it to your compost pile. Easy, right? The New York Times recently published an article on straw-bale gardening, which got me thinking again about the process this week. Is it a gimmick? Could it work? The NYT interviews Joel Karsten, who wrote a new book “Straw Bale Gardens.” The article also notes that it’s not a new practice; “commercial growers experimented with straw bale, arranging it in greenhouses or laying it in outdoor trenches” from the 1950s through the 1980s. It was apparently common in Eastern Europe and the Middle East. Local urban horticulturalist Linda Chalker-Scott, with the Washington State University Extension in Puyallup, also weighed in; she liked straw-bale gardening as a low-cost technique that uses natural waste materials and mimics natural processes. “This is one of those practices that disappeared for no good reason,” she told the NYT. Vegetables growing in straw bales. Photo by GradyJames via Creative Commons license. How does straw bale gardening work? 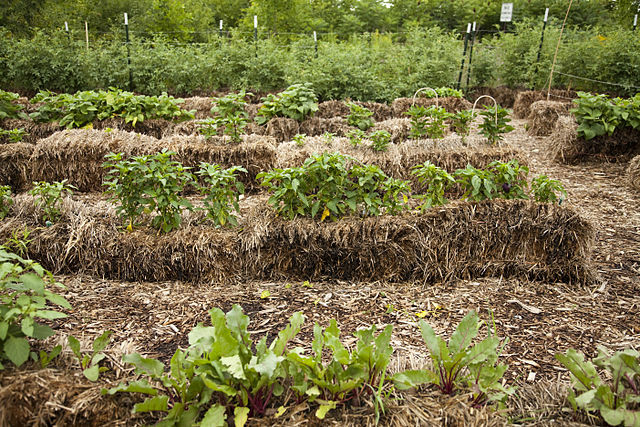 The straw bales (the kind you would find at your local pumpkin patch – choose weed-free straw over hay, which tends to have weed seeds) create a raised bed that’s about two or three feet high; it’s wheelchair-friendly as well as old-joints friendly! If you can find the bales (which retails for about $15 for a full weed-free bale at this North Seattle supply source), it could be more affordable than building a planter box or raised bed. Another advantage is that you could move the bales around from season to season. The straw slowly decomposes over time, releasing nutrients as well as residual heat to keep your plants happy against the Northwest climes. You’ll need to condition the bales before you start planting. This will take about 1-2 weeks and allow the straw bale to decompose a bit. Here’s a good tip sheet from WVU Extension on the step by step process of getting the bales ready for planting (this will require placing the bales, keeping them damp, adding fertilizers and waiting a bit for the bales to cool down. Here’s another fact sheet on straw bale gardens. Seattle Tilth usually has a straw bale garden at its garden at the Good Shepherd Center in Wallingford in case you want to see one in action. It’s Fix a Leak Week, and the EPA is encouraging residents to check and replace leaky plumbing and sprinkler systems to save water and reduce utility bills. The agency says that more than 1 trillion gallons of water could leak from U.S. homes each year. Many of the most common household leaks can easily be fixed, including leaking toilet flappers, dripping faucets and leaking valves in sprinkler systems. For great step-by-step tutorials on how to find and fix leaks from outdoor faucets and toilets, check out the Saving Water Partnership website. That same group offers tips on how to conserve water outside as well. 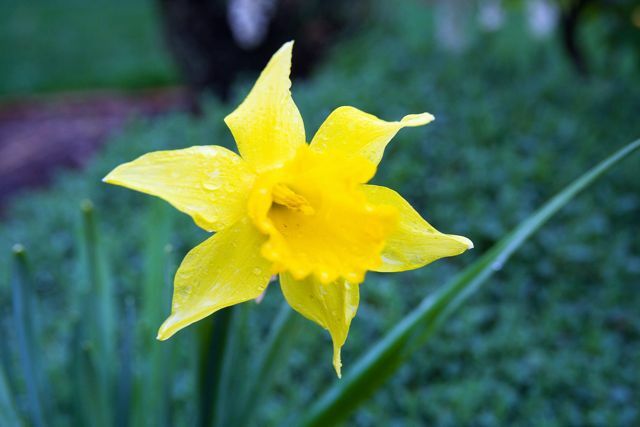 We’ve blogged here in the past about many ways you can conserve water in your landscaping. You can start by having a well-thought out plan for your landscape that incorporates low-maintenance, drought-tolerant plants. Picking the right plants for your conditions (whether shady, sunny, etc. 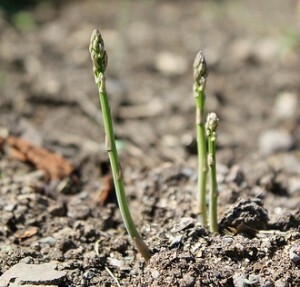 ), and you’ll have do use less water and fertilizers to keep them thriving. The Bellevue Botanical Garden’s WaterWise Garden, for example, shows you can be water-conscious and still have a garden with a wide array of attractive, colorful plants. 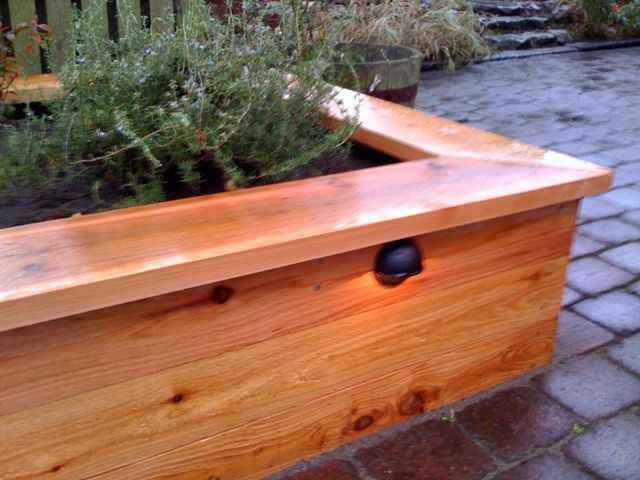 Read more from Western Washington University about how to conserve water in landscapes. We also encourage homeowners to check for leaks in sprinkler systems and consider upgrading to newer, water-saving technology to prevent overwatering. As we’ve noted in the past, the city of Seattle and other utilities in the region give homeowners rebates when they upgrade their sprinkler systems. Call Ecoyards for assistance if you think your in-ground sprinkler system is leaking. Our irrigation specialists can help determine whether and where your system is leaking, and come up with a plan to fix it. 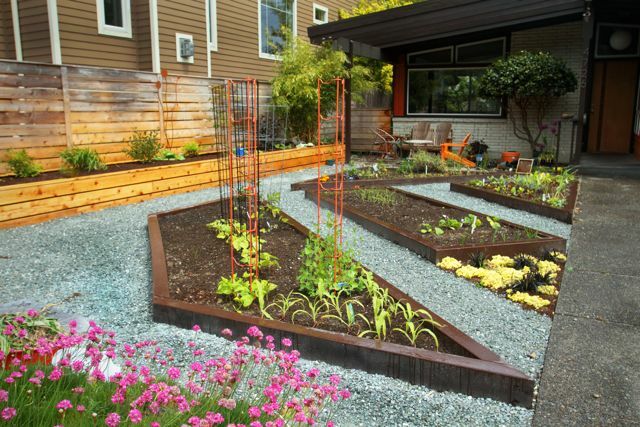 We also offer design, installation, and maintenance of efficient sprinkler and drip irrigation systems. Find out more about our irrigation services. The EPA recommends easy tips both inside and outside the house to check for leak problems. Check toilets for silent leaks by putting a few drops of food coloring in the tank at the bank, and watching whether color shows up in the bowl in 10 minutes (before flushing). Check outdoor hoses for winter damage and tighten connections. Compost pile. Photo by Bryn Pinzgauer, Creative Commons License. The city of Seattle and other partners are offering discounts on compost and kitchen scrap bins during Compost Days, a promotion that runs through April 15, 2013. The city is celebrating its success in diverting 125,000 tons of food scraps and yard waste from landfills last year, and that means coupons and discounts for you! All that waste was turned into compost that can be used in gardens. During Compost Days, you can buy 2 bags of compost and can get the 3rd bag free (find a participating retailer by entering your ZIP code). The promotion also offers deep discounts on bulk compost and kitchen scrap kits. What is compost, and why do gardeners love it so much? 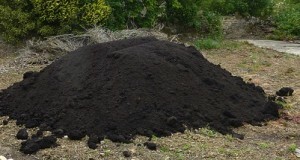 Compost is decomposed organic matter (grass clippings, newspaper, egg shells, food waste, etc.) that can be added to garden beds and landscapes to improve soil. 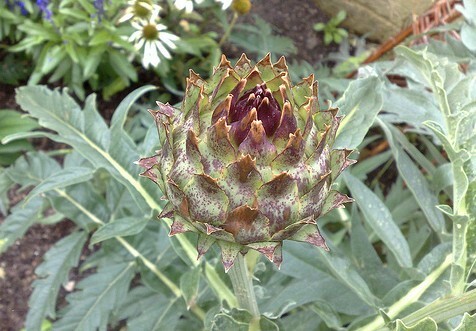 That rich organic material adds nutrients and beneficial microbes. It helps soil hold on to nutrients and water better, reduces water runoff, promotes healthier roots and prevents oil erosion. You can find a variety of compost products at local garden and hardware stores in the area, or you can make your own compost in your backyard. The King County Master Gardeners has published this helpful fact sheet on compost that tells you everything you need to know. The city of Seattle is also a great resource on backyard composting; it also sells compost bins through Seattle Conservation Corps, Parks & Recreation Department. One of the great things about doing business in Seattle is the number of resources available to help businesses improve on environmental practices. We recently had a consultant from ECOSS (Environmental Coalition of South Seattle) come out to help us improve our spill prevention practices. Ecoyards’ new spill response kit. ECOSS is a nonprofit that works toward improving the environment and provides education, resources and technical assistance to businesses and communities. One of its fields of expertise is stormwater pollution prevention. The group provides free, confidential services. We recommend it to other businesses. The group, working with Seattle Public Utilities and other groups, offers free emergency spill cleanup materials and spill contingency plans to Seattle businesses. ECOSS helped us prepare a spill prevention plan and gave us free spill skits for our trucks and warehouse located along the Duwamish in West Seattle. 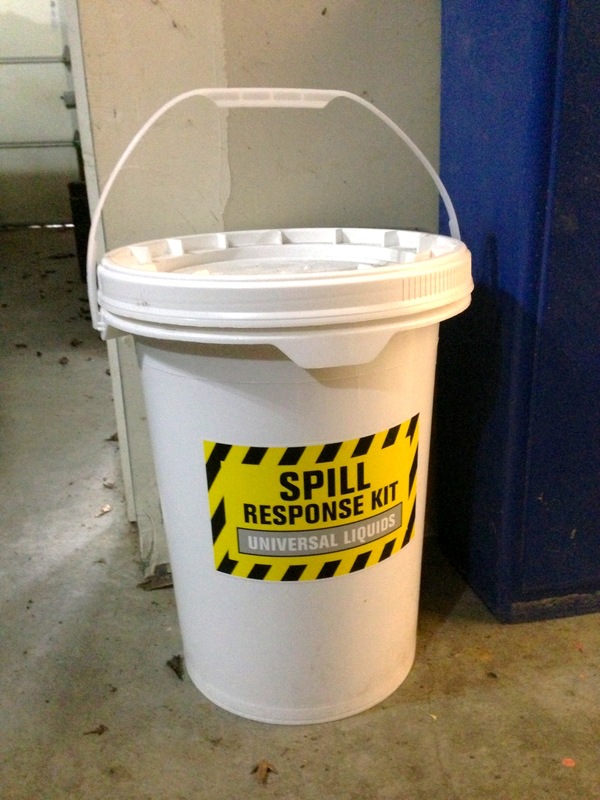 The spill kits are 6.5 gallon buckets that include absorbent booms, absorbent pads, goggles and other items. Ecoyards is pleased to announce we recently achieved the highest five-star rating from the EnviroStars program, which certifies businesses with environmentally responsible practices. Certified businesses have demonstrated a commitment to protecting the environment by properly managing and reducing hazardous materials and waste and other practices. The EnviroStars program was created by King County in 1995, and seeks to create healthier communities and protect natural resources by keeping hazardous and other unwanted waste out of the environment. 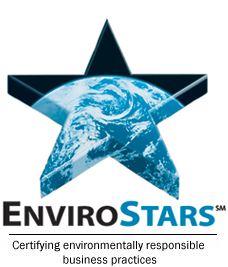 What does the EnviroStar rating mean for customers like you? It’s just one more reassurance that Ecoyards is committed to reducing our overall environmental impact and that we are being proactive in minimizing our footprint. To get a five-star rating, we have to show environment-related leadership in our industry or community, have a solid waste reduction program and implement measures to save energy, protect air and water quality and incorporate an multitude of “greener” business practices. companies receive a rating from 2- to 5-Stars; the higher the rating, the more thoroughly environment-friendly practices are built into the company’s policies and operations. To improve the star rating, a company has to become more proactive in reducing wastes and the use of hazardous materials. Five-stars demonstrate leadership on environmental issues beyond their own facilities – within their industry, organization and/or community.